As parents, what are some winter health tips for cold and flu season, and the winter months in general, to help ensure a safe season? Getting a yearly flu shot. Teaching good hand washing techniques. Minimizing or avoiding infections by not taking your newborn or younger infant out and around a lot of other people until he is older. Encouraging kids to avoid people who are obviously sick with a cold or the flu. Teaching your kids 'cough etiquette,' which the American Academy of Pediatrics describes as teaching children to turn their heads and cough or sneeze into a disposable tissue or the inside of their elbow if they don't have a tissue, instead of simply coughing or sneezing onto their hands, which will then spread their germs onto everything they touch. Taking a reusable water bottle to school, like a Sigg or CamelBak, instead of using the school water fountain, which may become contaminated with germs, especially during cold and flu season. Asthma: Changes in the weather and cold weather often trigger asthma attacks, which makes it important to have refills of your asthma relief medicines (Albuterol, Proventil, Ventolin, Xopenex, etc.) ready for the winter and an asthma management plan in case your child starts coughing or having other symptoms of an asthma attack. If your child's asthma always gets worse during the winter, it might be a good time to start an asthma preventative medicine (Flovent, Qvar, Symbicort, Advair, etc.) too. Chronic coughing: Although many kids have a cough during cold and flu season when they get sick, if your child typically develops a chronic cough that lasts most of the winter, then ask your pediatrician if he might have asthma. Dry skin: a lack of humidity from cold, dry air outside and the warm, dry air inside often leads kids to have itchy, dry skin during the winter. This can especially be a problem on a child's hands, which is made worse by frequent hand washing, and around his mouth (perioral dermatitis). Using a mild soap or soap substitute when your child bathes and then quickly applying a moisturizer for eczema within a few minutes can help to avoid and treat dry skin. You may have to reapply the moisturizer several times during the day though. Eczema: Kids with eczema often have red, itchy skin year round, but it can be worse in the winter. Talk to your pediatrician if your usual eczema regimen isn't working during the winter for advice on treating hard to control eczema, especially if using a topical steroid and moisturizers isn't working to control your child's symptoms. Nosebleeds: when caused by dry air, nosebleeds can be prevented by moisturizing your child's nose with saline or a nasal gel each day. Keep in mind that kids can also get nosebleeds when they have colds, sinus infections, or allergies. You can get the flu from a flu shot. The flu shot is made from a killed virus, so can't cause the flu. Even the nasal spray flu vaccine, although it is made from a live, attenuated virus, and shouldn't be used for people with a weak immune system, doesn't cause the flu. Extra vitamins and minerals can keep your kids from getting sick in the winter. Although some parents load their kids up with extra orange juice and vitamin C and other vitamins that claim to boost their immunity, they likely won't keep your kids from catching colds and the flu during the winter. Kids can catch a cold from playing out in the cold weather, especially if they don't wear a jacket or their hair gets wet. Colds and the flu are caused by viruses, not by being outside in the cold. Of course, if your child is playing outside with someone who is sick with a cold, they may very well get sick too. Being underdressed in cold weather still isn't a good idea, though. You can't get a sunburn during the winter. Although the sun's rays might not be as strong in the winter as they are in the summer, they can still cause sunburn, especially when they reflect off snow, so be sure to use sunscreen year-round. Kids can play outside as long as they want when it's cold. Kids are at risk for frostbite and hypothermia, so have them come inside to warm up at regular intervals, especially if they start to feel cold or tired. Your kids can stop their allergy medicines during the winter. Not all kids have seasonal allergies that are only triggered during the spring or fall. Some kids have year-round allergies, even during the winter. These children, who may be allergic to dust mites, mold, or pet dander, would likely do well to continue taking their allergy medicines during the winter. Kids need an antibiotic every time they have a runny nose, especially once the discharge is green or yellow. This is perhaps one of the more dangerous winter health myths, as it can lead to the overuse of antibiotics, which aren't needed for most runny noses, as they are often caused by colds and other viruses. When the weather gets cold, the furnace and fireplace go on, bringing their own issues with them. Don't skip over these tips for making your home safe for your kids, and yourself. Install a carbon monoxide detector in your home. Everyone should do this, but it's extra important if you use a fireplace or other non-electric heating source. Test your home for radon. The winter months are the best time to do a radon test kit. Exposure to radon in the home, something that can occur anywhere in the country, is the leading cause of lung cancer in non-smokers, and children are at particular risk both due to time spent in the home, and their sensitivity to the cancer-causing effect of radon. This isn't usually something that we think about with pediatrics, but your children will thank you years down the line if you take time now to ensure their safety. Keep in mind that while many parents use a cool mist humidifier during the winter to help kids with nosebleeds and dry skin, those higher humidity levels can also increase the levels of dust mites and mold in your home, which can trigger allergies in susceptible people. Dress kids appropriately for the cold weather, typically adding one extra layer to whatever an adult would wear to be comfortable. Kids should wear several layers of loose-fitting, light, tightly woven clothing under a heavy jacket to keep them warm, plus mittens or gloves, a hat, scarf, and waterproof boots, especially if they are going to play in the snow. 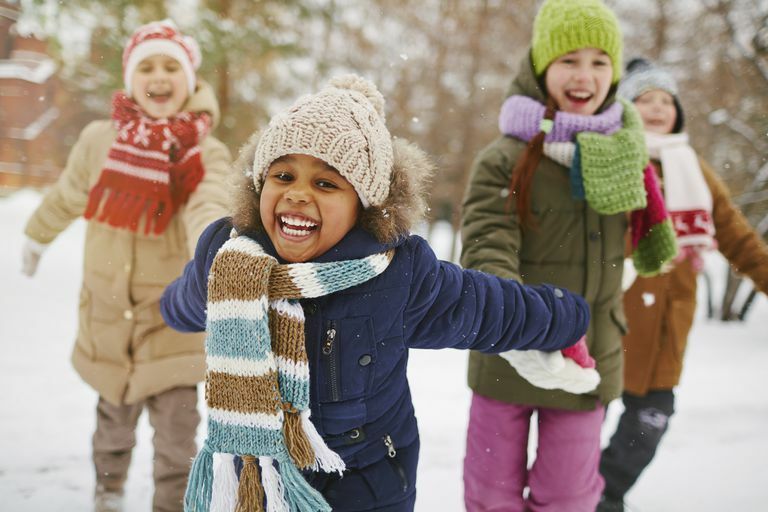 Try to keep your kids physically active during the winter. Although it is often too cold for outdoor sports, unless you live in an area where you can play ice hockey or regularly go snowboarding, many kids stay active in the winter by taking up an indoor sport, such as basketball, indoor soccer, indoor flag football, or volleyball.